Thanks to the kind folks from Scholastic, we received 2 mini series of In-Action books to review. The bookworms in the house were so excited and could not wait to start reading these books. During my schooling days, I remembered my tutor bought me a thick book that contained all these phrasal verbs. It looked exactly like a dictionary. There were no colours and no pictures in it so you can imagine the bored look on my face +__+. I did not even want to touch or read the book no matter how good my tutor try to convinve me how it will benefit me in my composition writing. The book is still sitting in a quiet corner on the book shelf. I tried get them to read the book and they had the same reaction as me. 2) The explainations are easy to understand. 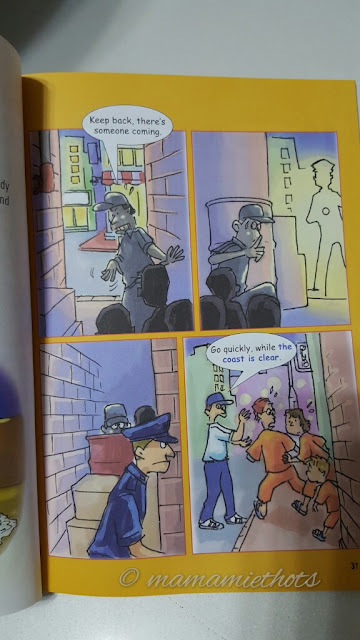 3) Comic style pictures to further illustrates about the meaning. 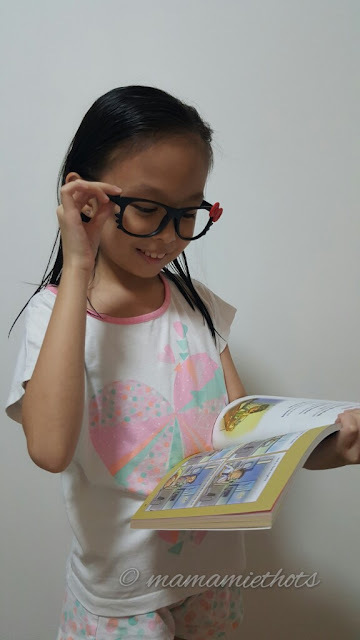 Although the recommended age for In-Action series is for 9-14 years old but if you have a child who is an advanced reader, I am sure they will enjoy reading these series too. Currently there are 16 In-Action mini series and 2-3 books per series. All series have 60 language items in each book. They are retails at all Popular Bookstores and selected Times Bookstores. Don't be confuse with the "More" series, they are just a continuation of the original series. You can go to this website for more info on other series. 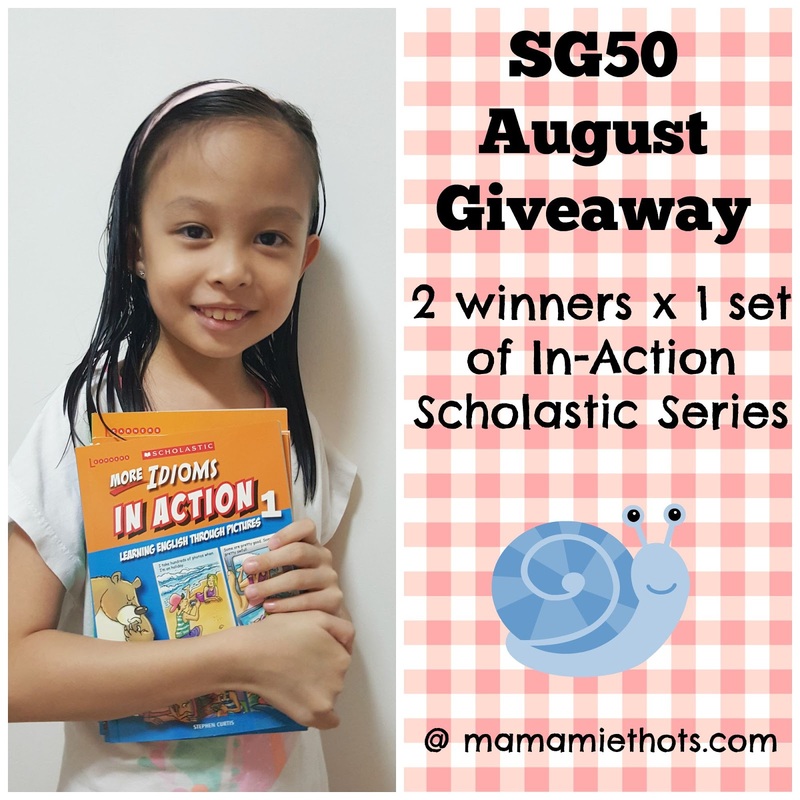 Scholastic will be giving away In-Action series to 2 lucky winners from my blog. 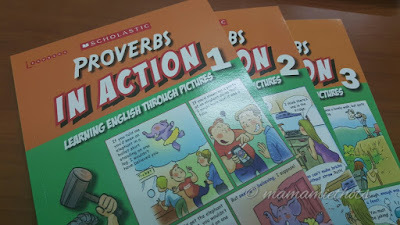 You can choose between "More Idioms In Action (Book 1-3)" or "Proverbs In Action (Book 1-3)". * All personal details provided in this contest will be kept confidential. Only details of the winners will be shared with Scholastic to facilitate the redeeming of prize. Disclaimer: We received 2 mini series of the In-Action Scholastic books for review purpose. No monetary was compensated, all opinions are our own. I was acting as a look out. 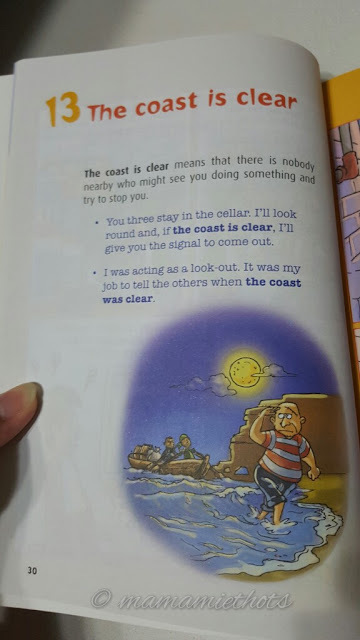 My job was to tell the others when the coast is clear. 1) Which In-Action Series do you want to win? More Idioms In Action. 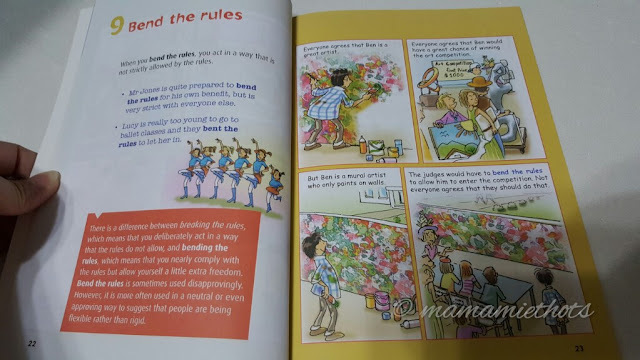 2)Create a sentence using a proverb or an idiom : Jane accuses Jack for not keeping his bedroom clean and tidy when in reality, Jane has a messy bedroom. Therefore, Jane is guilty of "the pot calling the kettle black".
" It's raining cats and dogs!" - meaning it's raining heavily. You should ask your brother for help about this problem as two heads are better than one. I would like to win Proverbs in Action series. A good sales man must be able to think on his feet to close the deal. 2. Finishing all my home work in half an hour is a piece of cake as I pay attention during lesson time. It has been raining cats and dogs during the NDP weekend. 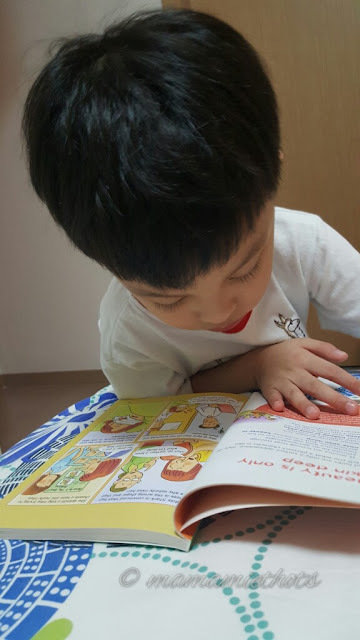 Ah boy sighed in resignation that he could not make it to the movies tonight as he would have to burn the midnight oil for his exams tomorrow, for which he had not studied. Hope to win the idioms set. Thanks. 1) I want to win More Idioms In Action (Book 1-3) 2) We meet each other once in a blue moon. Aiming to be the early bird that catches the worm, I woke up early and went to the museum two hours before the redemption time, to queue up for a pair of free tickets to the new film 7 Letters. 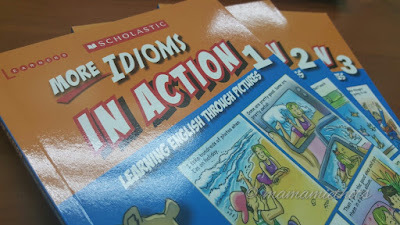 Hope to win the idioms book. Thanks! Once in a blue moon, my son will tidy his bag himself rather than me doing it for him! I would like to win "Proverbs In Action (Book 1-3)". Nancy promised to turn over a new leaf and stop telling lies to her parents. There's no place like home to grow old.